Birds nest in various spots in my garden. House sparrows, of course — last year they moved into a long-disused birdhouse attached to the garage, and have been very busy producing more sparrows. I have found three bushtit nests in recent years. 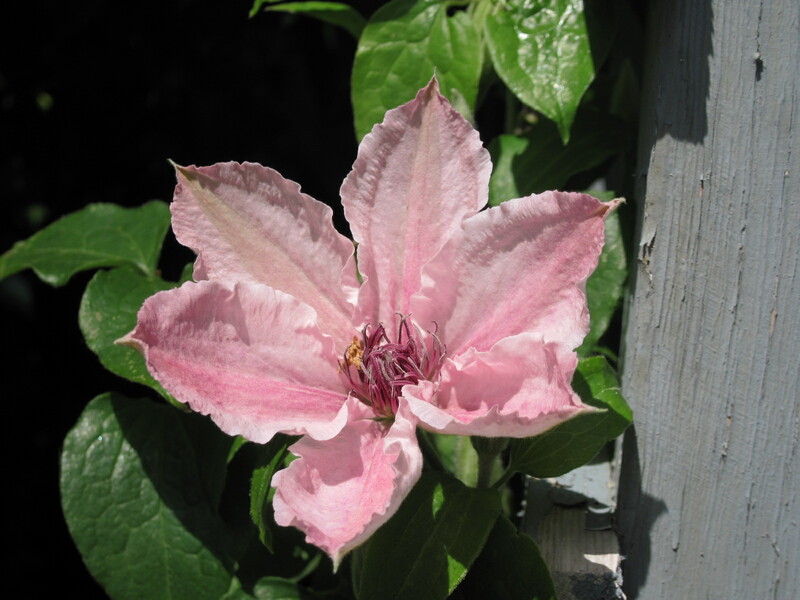 The latest one was in a ceanothus right next to the front walk. Sadly, something (probably a crow) yanked it out recently. I found the nest (a small work of art made of lichens, spider silk, dryer lint, grasses and feathers) lying on the street, under a power line where the crow probably took and dropped it. I hope the nest was unoccupied at the time. And now we have the Shoe Bird! My preferred footwear in the garden is a pair of Duck Shoes — cheap rubber shoes that slip on and off easily. 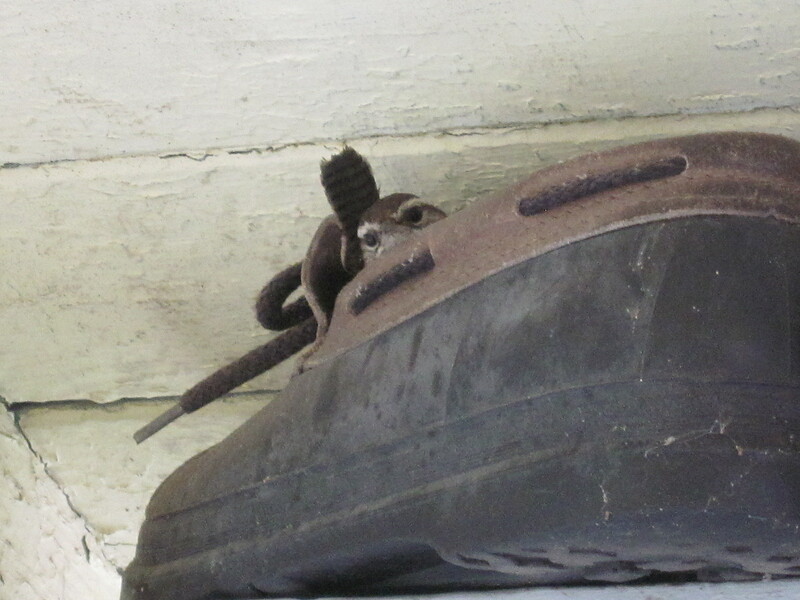 Until the advent of Nelly the Newf, I used to kick them off on the back porch, but since Nelly likes to chew shoes, I resorted to parking the duck shoes on a beam that holds up the porch roof. A couple of weeks ago, I found an amazing lot of plant material (dried moss and grass) stuffed into both shoes. Since I’d worn them the day before, I was quite surprised. The creature responsible turned out to be a Bewick’s wren. Once I observed it stuffing the shoes, I removed the current ones and put them inside, replacing them with a worn out pair I hadn’t gotten around to disposing of. I made sure to put all the nest material into the replacement shoes. The bird didn’t seem to notice, just got on with nest-building. 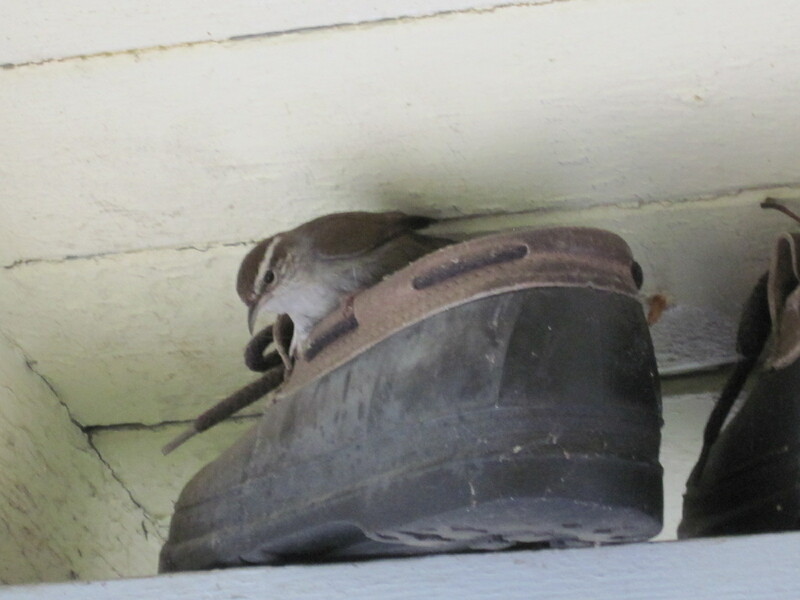 I have no idea whether it’s intending to hatch out a brood of tiny wrens in the shoe. Wikipedia says Bewick’s wren males sometimes build “dummy nests,” hoping to attract females to take over and finish the job. (Hmm. No comment; we’re talking about birds). Maybe that’s what’s going on here. I don’t know, but in the meantime, the bird is an interesting addition to the scene. 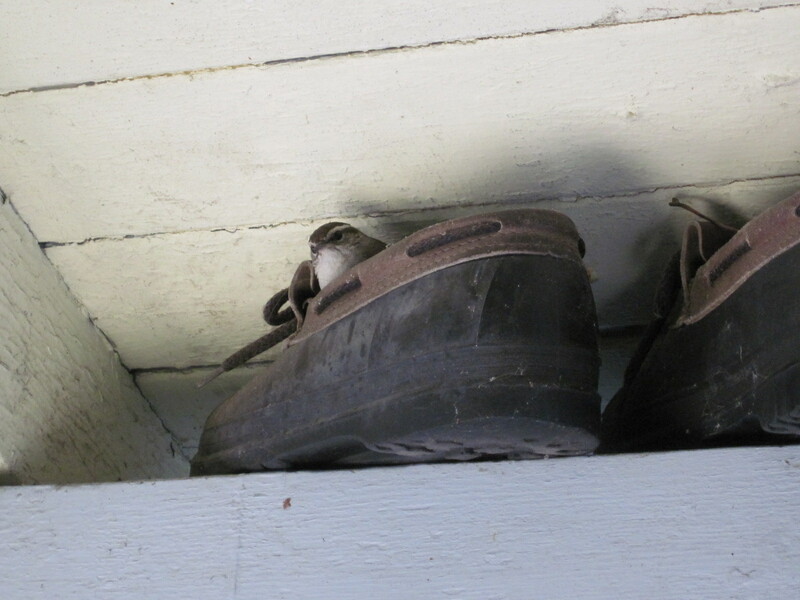 I have definitely never seen a bird in a shoe. Very cool! It is cool! Funny how you feel special when a wild creature decides to live near you. Thanks for reading and commenting.